The historical, artistic and social context out of which Lecoq's work and pedagogy arose, and its relation to such figures as Jacques Copeau, Antonin Artaud, Jean-Louis Barrault, and Dario Fo. Core themes of Lecoq's International School of Theatre, such as movement, play, improvisation, masks, language, comedy, and tragedy, investigated by former teachers and graduates of the School. The significance and value of his pedagogical approaches in the context of contemporary theatre practices. The diaspora of performance practice from the School, from the perspective of many of the most prominent artists themselves. 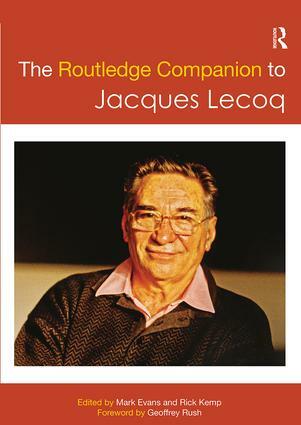 This is an important and authoritative guide for anyone interested in Lecoq's work. Mark Evans is Professor of Theatre Training and Education and Associate Dean (Student Experience) in the Faculty of Arts and Humanities at Coventry University. His research focuses on the work of Jacques Copeau, Jacques Lecoq and movement training for the modern actor. He recently edited The Actor Training Reader (Routledge, 2015) and is an Associate Editor of the Theatre, Dance and Performance Training journal. Rick Kemp is Head of Acting and Directing at Indiana University of Pennsylvania, and the author of Embodied Acting (Routledge 2012). He has worked internationally as an actor and director with companies and theatres such as Commotion, Complicite, Almeida, Teatr Polski and the Bouffes du Nord.